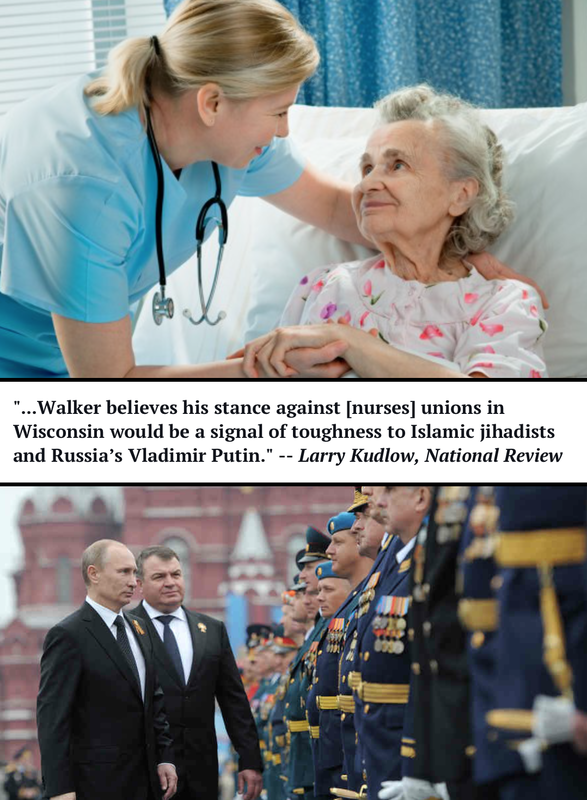 and Putin is rolling on the floor in hysterics over Walker’s false sense of being such a tough man, taking on nurses, who are mostly women and like him having his constituents arrested for singing in the Capitol building like that 90 something old man with a cane, handcuffed a few years back that the news aired for all to see how well he treated the people back then and yet, they voted this criminal back into office. I am really liking these images Nicole. Seriously delusional and below average intelligence to boot. Who will take care of him when he gets sick? It is obvious he is not looking at (or caring about) the long term consequences of his actions. He is not a leader–he is a liquidator for the 1% and he is selling Wisconsin piecemeal.